Sarah Slater is from Baltimore, MD, and she won a Y5,000 gift coupon to Esthetiq Salon Come Across in this week’s JU raffle. She has been on Okinawa six months and says he loves it. “Everything from food to beaches is just wonderful,” she declares. She says that she loves to spend her weekends with her husband exploring the island. She is especially interested in scuba diving and looks forward to getting certified in the near future. 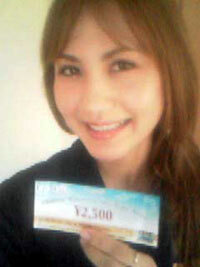 Christine Brown won a ticket to relax at Kupu Kupu Spa. She’s from Pensacola, Florida, but has lived on Okinawa six years. She says that her life here is very enjoyable, and spends her free time sight seeing, shopping and studying. She says she especially enjoys live music concerts, and also spending quality time with her family and friends.